So you’ve got this great idea for a story and you decide, just to make life interesting, you’ll place it on a planet that has two suns. Why not? It worked for Star Wars, it can work for you. Yes it can, but there are few things you need to know before you just throw that extra sun up in the sky and start imagining your main characters wrapped in the rosy glow of dual sunsets. Even Star Wars didn’t always get it right. Figuring out how any fictional planet will look and act is complicated. It would take a whole big pile of math to be technically accurate – a lot more than I can give you here. But just focusing on the two suns, we can consider a few basics here. 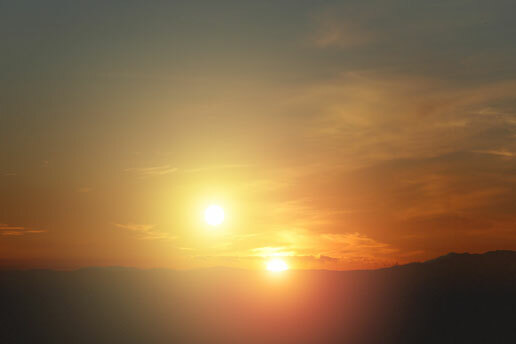 What, exactly, does it mean to have two suns? It means that your planet is orbiting a binary star. 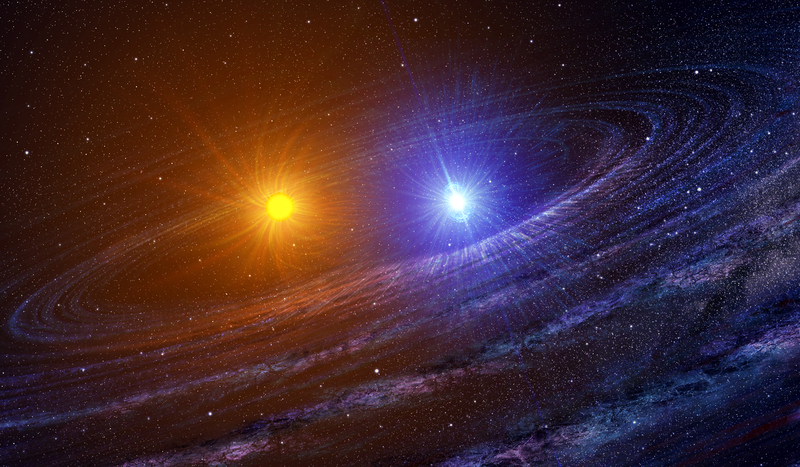 Binary stars are two stars that are so close together that they orbit around a common center of mass. Take a look at this NASA simulator and play with the numbers. You’ll see how changing the size and mass of the stars changes how the suns would behave in relation to each other. Now let’s add the planet to the mix. We’re going to assume, for this discussion, that your planet orbits both suns as a unit, so does not pass between them. How the suns look to viewers from your planet can vary. One might appear brighter or larger than the other. This would depend on both size and distance. While your planet is circling the suns, it is also rotating, providing day and night. Let’s assume, for simplicity, that your planet is earth-sized and rotating at a similar rate. To know how sunrise and sunset would work, you’d have to know the exact relationship between the two suns – the mass and size of each, how far apart they are, and how distant they are from your planet. 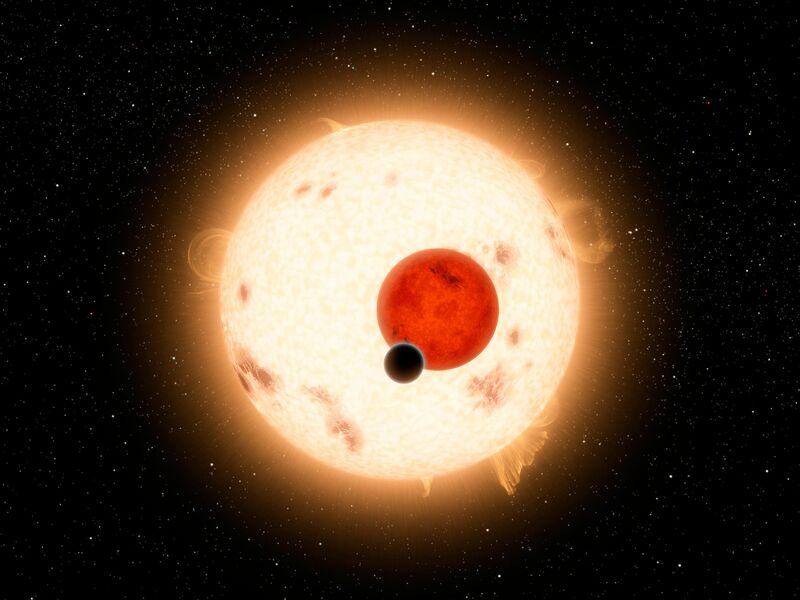 But rather than figure all that out, let’s take a look at a real planet with two suns. As well, your day lengths would also vary depending on how far apart the two suns were (from your vantage point) on any given day. Different suns might be different temperatures, so would give off different colored light. This would affect, not only how things look to your characters but would also affect things like plants and photosynthesis. Temperature on your planet would depend on the size of your suns and your planet’s distance from them, just like here on earth. Seasons are dependent on the angle of your planet’s axis. You could just decide that your suns and planet are a lot like ours, but at the very least, you’d need to take into account the large difference between times and seasons when both suns are in the sky for long periods and times when they are both absent. Now we have to consider two “years”: the time taken for the planet to orbit Sun #1, and the time taken for the two stars to orbit one another, which will necessarily be longer – perhaps up to 100,000 times longer. I’ll call this second year the “long year” and the other one the “short year”. We can imagine that a short year is something like an Earth year.” (Stack Exchange Physics). Do you want your planet to have a moon? If so, keep in mind that the phases of the moon are just variations in how the sun reflects off the moon as viewed from earth. With two suns, you can’t just throw a full moon willy-nilly into your sky. Assuming that “The moon orbits the planet, the planet orbits Sun #1, and Sun #1 forms a binary star system with Sun #2. … the Moon would reflect light from both Suns. It would typically look like two moon phases super-imposed on top of one another. If two stars were different temperatures (thus giving out different coloured light), I imagine this would look really cool.” (Stack Exchange Physics). Finally, we haven’t even considered how two suns would affect living things on a fictional planet. In reality, everything would be different, even on a remarkably earth-like planet. Just reeling a list off the top of my head — the presence of two different suns of different temperatures, the variation in day-length and seasons, the effects of “colored” sunlight on the evolution of visual systems, the presence of an atmosphere – all of these would completely change the life on your planet. Not to mention the cultural and psychological effects on your planet’s inhabitants. For a haunting extreme example from science fiction, see “Nightfall” by Isaac Asimov, a short story about a planet with six suns, where people have never experienced darkness – except this once. But those can be a topic for another day. Live Science: What Would Earth Be Like With Two Suns? Stack Exchange Physics Forum: Two suns, one moon, and one planet? The Guardian: A planet with two suns? Maybe sci-fi author Isaac Asimov can enlighten us. Finally, if you really want to get it right, you might try out Universe Sandbox to simulate your imagined world.